I was recommended Elena Ferrante by a friend, along with cautionary advice that Ferrante was ‘close to the bone’, a phrase somewhat akin to James Wood’s description of her writing as ‘intensely, violently personal’. I started with The Days of Abandonment, perhaps Ferrante’s most popular book in English, narrated by a woman whose husband unexpectedly leaves her. While this particular plot is familiar, Ferrante’s version is unlike any other I’ve read. Her prose is stunning and polished, yet retains a raw, stripped-back feel. To be so closely invested in a character who is openly distraught was both distressing and irresistible. Ferrante’s latest novel to be translated to English is My Brilliant Friend, a work more accessible than The Days of Abandonment, but no less powerful for it. Billed as a three-part bildungsroman and set in a poor, violent Neapolitan neighbourhood during the 1950s, the novel explores the friendship between Elena and Lina. Opening with Lina’s planned disappearance, at age 66, in an attempt ‘to eliminate the entire life that she had left behind’, Elena decides she will write down their story. It is through her eyes that we see the two lives unfold. The girls are poor and studious, but early on it becomes clear that while Lina is the more vivacious, the more brilliant, she is also the ‘bad one’, scary and dangerous, while Elena is the good girl. 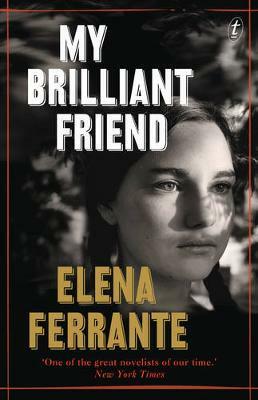 One of the aspects I loved most about My Brilliant Friend was Ferrante’s biting portrayal of a friendship (Elena and Lina are the most brilliant example of ‘frenemies’). The two girls are competitive, caring, jealous, needy; small slights can cause true suffering, while careless gestures of affection – great happiness. Such moments ring with familiarity, but, as with The Days of Abandonment, Ferrante represents this commonality in a way I’d never encountered before. Her novel is clean, pared back and, as my friend had warned me, so close to the bone you can feel your teeth grinding. The result is shockingly good. Bronte Coates is the Online & Readings Monthly Assistant. She is a co-founder of literary project, Stilts.